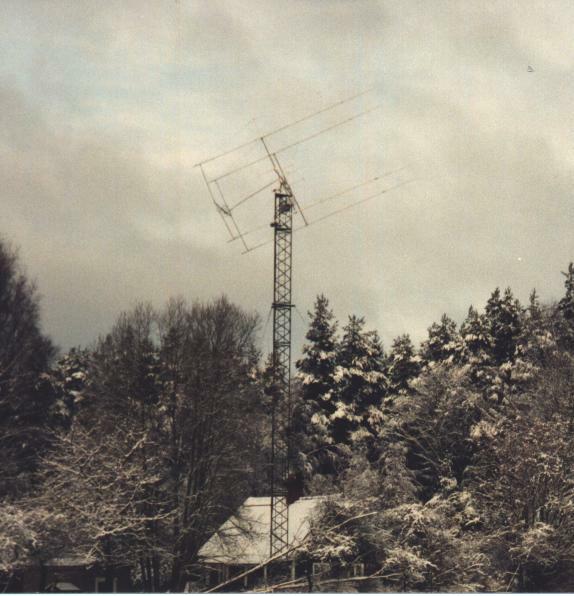 This picture is of my old EME setup for 2m (144MHz) at JO87EB. 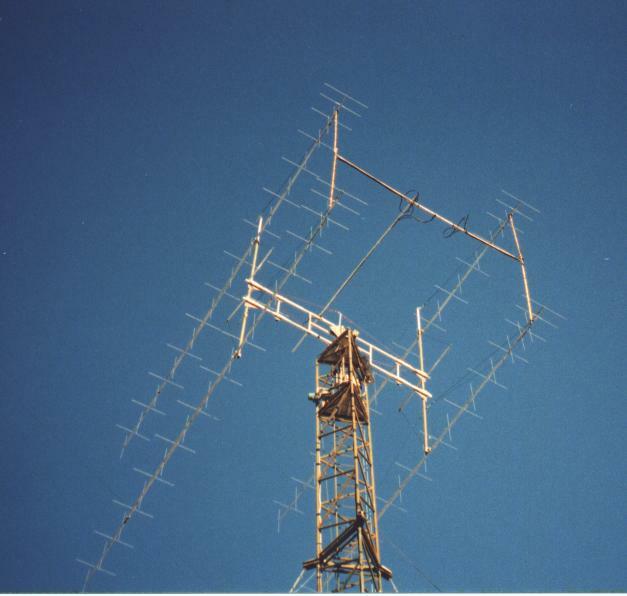 The antennas are 4 * 2MXP28 dual pol yagi from M2 antennas, at 23m AGL. The picture is from 1998 or 1999. Here’s the story of how I have been working EME (moonbounce) on 2m over the years, up until the year 2000. I worked my first ham qso 10-oct-1987, it was UZ2FXE on 80m/CW. 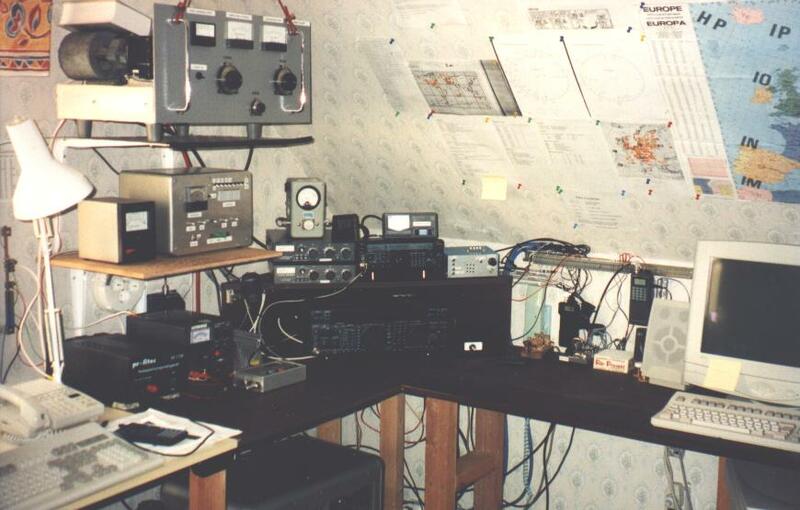 From 1987-1992 I was qrv on HF from time to time. For various reasons I didn’t work much during this period, for instance my military service. A great interest in dragracing resulted in me “living” in the garage a couple of years building and tuning american V8 cars. In 1992 I aquired a pair of tube-amps from Stig SM7BKZ, one for HF with 2xQB3,5/750 and another for 2m (W1SL 2x4CX250B). At this time I didn’t really know what I was going to do with the 2m amp, I was not familiar with the world outside FM on freq’s above HF, hihi. I was contacted by Sverker SM7THS and Tommy SM7NZB. They knew that I owned the amp for 2m, and they asked me if I wanted to take the amp with me to SK7CA (club stn in Kalmar) and try to work some EME. I said “Cool”, didn’t know much abt. EME and didn’t know these 2 strange hams that wanted me/my amp to participate, hi. 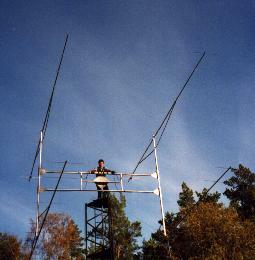 So in 1992 ARRL EME contest we tried to work with 4xF9FT and my amp. I had just rebuilt it and of course it did not work OK. I remember I had HF all over except where it suppposed to be, in the shack and in my fingers instead of out from the antennas! But we had a lot of fun and I learned a lot. The result? Well with a brick of abt 100W we only wkd 1 qso (DL8DAT) in one weekend. After this I got qrv on 2m allmode from my home qth on tropo with a single 9 el yagi. In 1993 we should come out BIG with my amp qrv, a different qth (still SK7CA). Unfortunately the antennas ended up at almost ground level. On the hill where the qth is there’s a lot of trees, so the antennas were pretty much in a forrest! I think we pushed out abt 600W, 7/8″ tx cable and the same 4xF9FT. Well after an entire weekend we managed 4 qso’s and 3 mulitpliers. Operators were: SM7SJV, SM7THS, SM7NZB and yours truly. 1994: This is it! Sometime 1993-94 I bought 4x Cushcraft 17B2’s from Ulf SM5MIX (SK). This year we took them to SK7CA and mounted the array at 18m agl. We had aircom+ for phasing cables, 1/2″ TX cable, RG213 for RX and MGF1302 preamp. This year a vy experienced VHF operator joined us, Kjell SM7GVF. Now we really got things going. Kjell showed me some mods for my amp and later on I pushed it to 1100W output with no tubes going down. Anyway for the ARRL EME contest we connected my amp and Kjell’s 2x4CX250B amp together, it wkd ufb. We did 83 qso’s the first weekend and 27 qso’s in part II, totals: 110qso and 43 multipliers. Operators were: SM7GVF, SM7SJR, SM7SJV, SM7THS and SM7NZB. This was the last time we wkd from SK7CA, at least for the time being. The club house is located in an industry area, no neighbours to worry for TVI, but a lot of spurs from the industries. 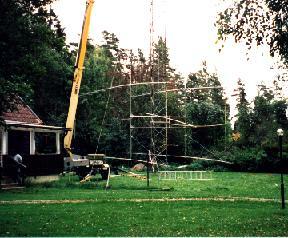 Picture taken at SK7CA, shows the eme array, a dish for 23cm tropo and a 70cm yagi. In 1995, I had moved to a qth out in the countryside (JO87EB). There I raised a short tower (8m), I kept my 4 yagis now with greater stacking distance (4,6m horiz and 4,3m veritcal). 7/8″ tx cable and Aircom+ for RX, Aircom+ phasing cables and I still used Kjell SM7GVF’s MG1302 preamp. We wkd parts of weekend no2 in the ARRL contest, 16qso’s and 11 multipliers (conds were lousy). 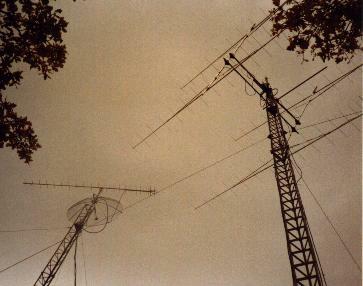 Operators were: SM7GVF, SM7THS and SM7SJR. 1996: Bought a new amp: 8877 strip line design, it worked very nice.I used the same array of 4x 17B2’s. This years ARRL EME contest resulted in 54 qso and 24 multipliers. Operators: SM7THS, SM7GVF and me. In 1997 I went qrt, sold the array back to SM5MIX who shipped it to Lars SM4IVE. I was aiming for X-yagis like everyone else! First I planned to build an array, got my hands on a half ready set of 4 yagis. But it didn’t turn out gd. Instead I bought 4x 2MXP28’s M^2 from DF6NA, Rainer. I experienced a lot of troubles with getting qrv agn. I didn’t just swap antennas, I also rebuilt the rotators, indications, bought new rigs, built new T/R sequencer and more. As it turned out I have the RF-deck of my 8877-amp, parts of the H-frame and the cw keyer left from the original setup (I don’t know why it always ends up like this?)! On top of all this when we were tuning the array an accident happened. We were on abt 3m height lifting the array a bit to be able to tune the lower 2 antennas when a wire broke. The whole array went into the ground. The lower 2 antennas went straight off and all the vertical elements from the middle and the back were smashed. After a whole weekend we got the antennas straight, tuned and ready to lift. As it turned out the skylift didn’t make it, abt. 0,5-1m to short for my lift to 23m agl! Standing on a tower at 22m agl with nothing to hold on to and balancing an array of 4,5m x 4,5m,weight abt.50-60kg in the wind??? No thanks! So we left the array at 17m bolted to the tower. 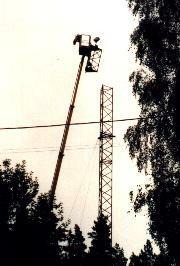 A few weeks later a truck came by with a crane of 33m and it was in position after 1-2hrs! Mounting the last 2m of the tower. Lifting it with rotors and all. Guy wires at 16m agl, tower is 22m totally. Building the new array of 4 x-pol yagis. It took me quite some time and money before I could hear my echoes agn, 6-nov-1998 was the big day. Hrd my echoes, but rather weak and not on horizontal polarization. I had a sked with EA6VQ on the 7th and it went fine, tx/rx vertical. Later on I discovered that the preamp on the horiz pol didn’t wrk at all, and the vertical pol preamp was not gd but it did gain a little. After that I put up two not-so-good-preamps, but they wrk and I can wrk both polarizations. I really look fwd to a great future of many nice EME contacts. The array seems to wrk fine, smaller adjustments needed of course. I have to watch out for the winds though. I want to thank everyone that has contributed/made it possible for me to be on EME. SM7THS, SM7UTA, SM7SJV, SM5BSZ, SM5FRH, SM7UFW, SM0LCB, SM5IOT, VE7BQH, DF6NA and many more. I also want to make some PR for EME, it is great to work. The ARRL contest 1998 wasn’t a hit for me. For part 1, I didn’t manage to get the array up in time. For part 2 however I was qrv and very “hot”. Then Murphy struck agn. Ice! I suffered from abt. 3:1 swr and degraded RX, for the entire friday and saturday. So during this time I only wkd the “big guys”. But on sunday afternoon the array was OK agn, the last few hours of moon on sunday evening was the only time I had with the system at full capacity. 23 qso’s and 13 multipliers is the result. I am now planning some sort of arrangement so I can lower the array to the ground, hopefully I will have such an arrangement going in the future. The ARRL contest 1999 was a lot better than 1998. Managed to log 112 qso and 41 multipliers. 1999 I am in the single op class. I was QRT abt 6 hours of contest time each weekend. This looks gd for the future, maybe I could do abt 130 qsos in a arrl contest? Dual polarity is a must when doing EME, I can not believe I have been doing EME with mono polarity! I am QRT agn! I will move to a house in JO86DU. I regret leaving the JO87 square but other things affects our decision to move.